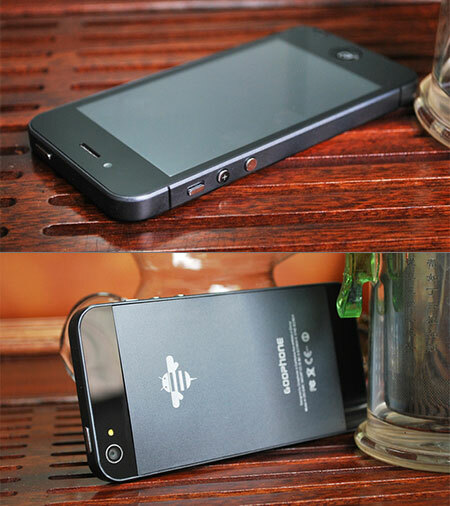 From afar and up-close, this device may look like the iPhone 5, but it’s actually the GooPhone i5. That’s right, thanks to all the controlled leaks from Apple, phone manufacturers in China are already starting to produce knockoffs, with this particular model being Android-powered. Continue reading for a video, more pictures, and additional information. If that isn’t enough of a let down well be prepared to be upset a little more as the GooPhone i5 uses a single core MTK MT6575 1Ghz CPU, has just 512mb RAM, a front 1.3 mega-pixel camera and rear 5 mega-pixel camera. So the ‘new’ GooPhone i5 is actually more like the GooPhone Y5 but with a slight redesign to give it the appearance of the rumored iPhone 5!